Most seasoned gardeners know that generally Cannas are grown from roots that are stored from one year to the next, much like potatoes. Cannas can also be grown from seed, just like a Marigold or any other type of flower. We have grown Cannas from seed for the past four or five years, always sowing a couple dozen or so. This year I decided to do a large planting of these flowers. So I ordered several packets of the variety; ‘Indian Shot’ from Thompson & Morgan Seed Company. ‘Indian Shot’ has various colored blooms ranging from yellow to red, set on green or bronze foliage. We sowed the seeds back in late January into one of our greenhouse flats. They germinated in about 2-1/2 weeks with about a 60% germination rate, which is typical for this species. 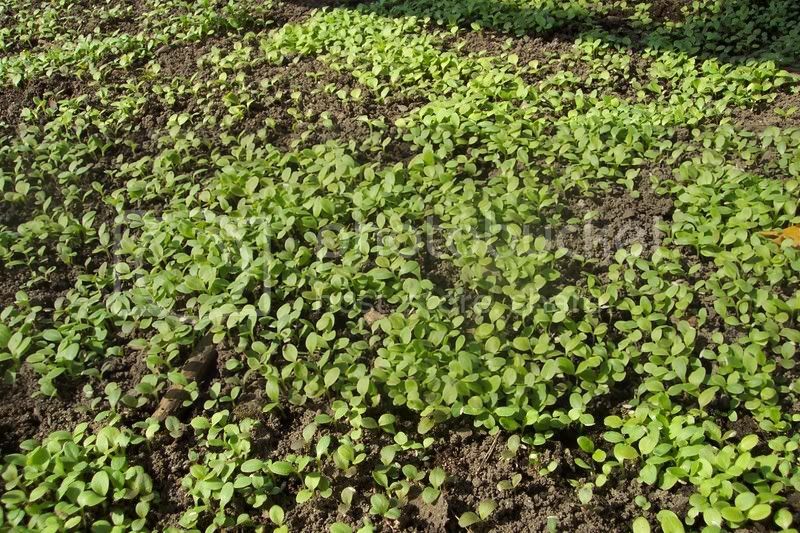 The seedlings were moved into 1-1/2″ cells about a month later. In early March they were transplanted into 4″ round pots. 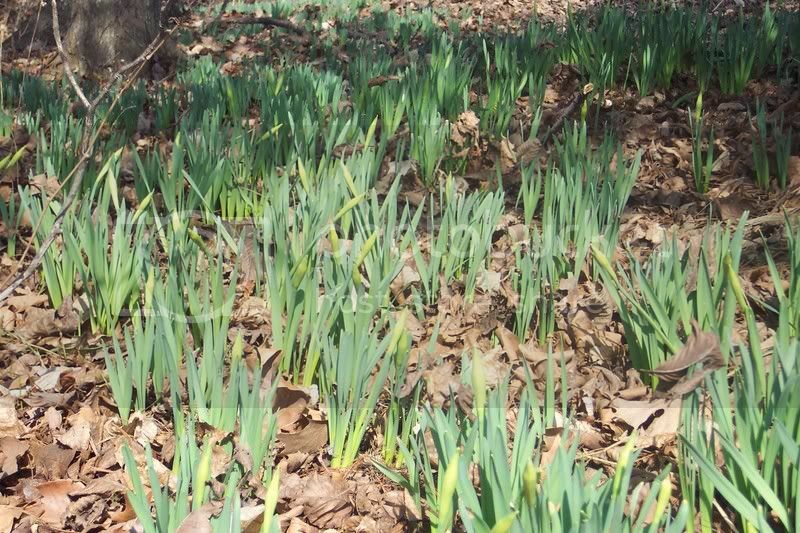 After Memorial Day, when then soil has warmed up, they will go into the long flower bed that is located next to a driveway. 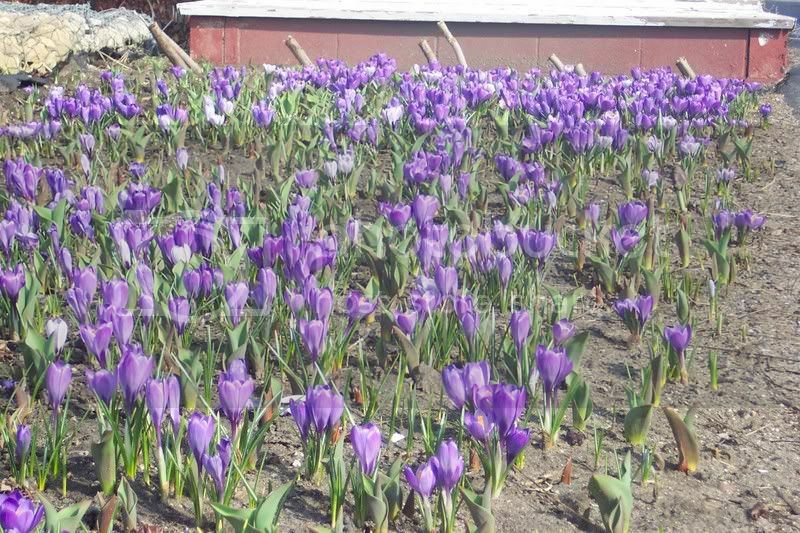 The same 90′ long bed that has crocus flowering in it right now. Often Cannas from seed will make a first flush of blossoms after reaching a height of about 3′. 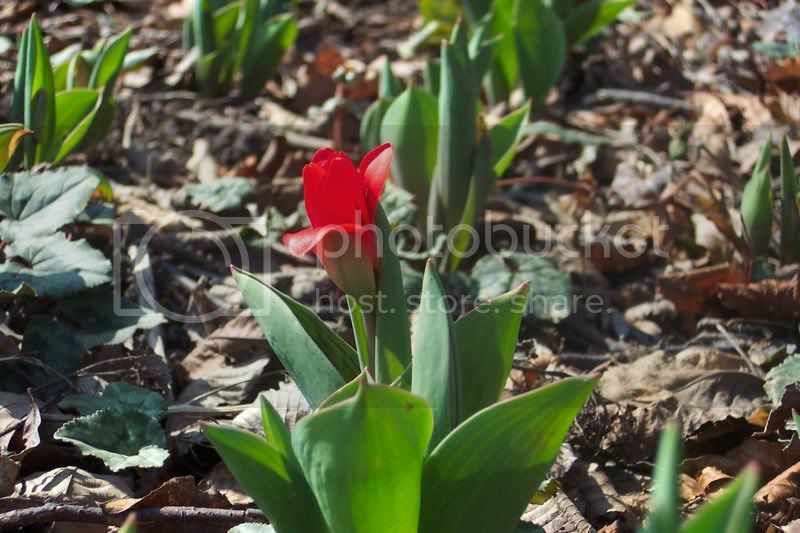 As the season progresses, they will continue to grow and bloom again at their final height of around 4 to 5 feet. 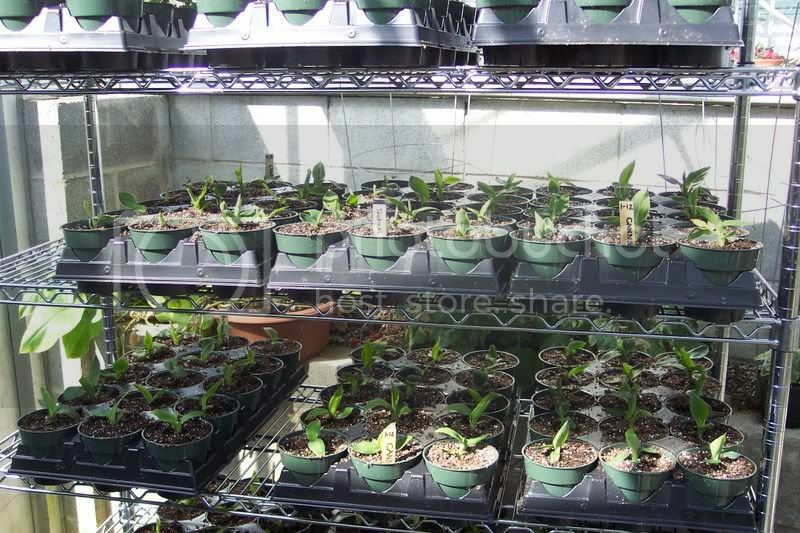 After the growing season has ended, these Cannas can be dug up and stored just like any other Canna and replanted next spring. The seeds sure take up a lot less space than the roots! I thought you might be interested in seeing some photos I took a couple of days ago during that record breaking warm spell. Here are just a few of the things happening this week. Have you had a chance to see what’s up in your garden? Every spring for a number of years now, I and my co-worker, Adrienne, have been putting together a Spring Display during March in the conservatory of the Matthaei Botanical Gardens. Adrienne grows the plants and bulbs in a back greenhouse, timing them so they bloom just when we want them to. 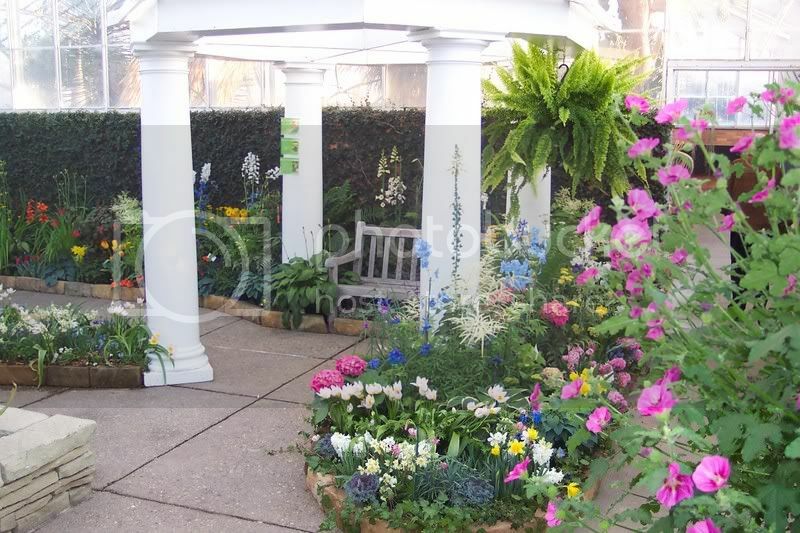 Then I and my volunteers put the display together using the gorgeous plants and blooms. This year’s theme has been “Heirloom Varieties”. We had a classic red tulip called ‘Coleur Cardinale’; an old time all yellow daffodil called ‘King Alfred’; a tiny species daffodil (which means its the same as what was found in the wild , in this case in the 1600′s) with a common name of Petticoat or Hoop Daffodil. It was only 6-8 inches tall with a little trumpet 1/2 -3/4 inches wide with a little frill around it. It was darling. We also had a yellow tulip with red splotches called ‘Kaiserin Kroon’ and another yellow and red tulip called ‘Rembrandt’. Both of these were antique varieties. The background greenery of the display was hostas, Japanese Ferns, Ostrich ferns and a perennial called Goatsbeard, that I would recommend for your perennial garden. It has a white fluffy flower, reminiscent of an Astilbe flower but looser and fluffier. It does like a moist spot so choose accordingly. We had 4 varieties of hyacinth which scented up the conservatory. One variety was called ‘Macaroni” and another called ‘City of Harlem’. Tulips and hyacinths last only a week in the warmth of the conservatory, so we changed the dispaly every week and brought in fresh blooms. Designing with flower colors is one of my favorite things to do, so I enjoyed the whole process. Of course I have 3 to 4 volunteers one day a week that help with the redo. We all savored the first touch of spring. 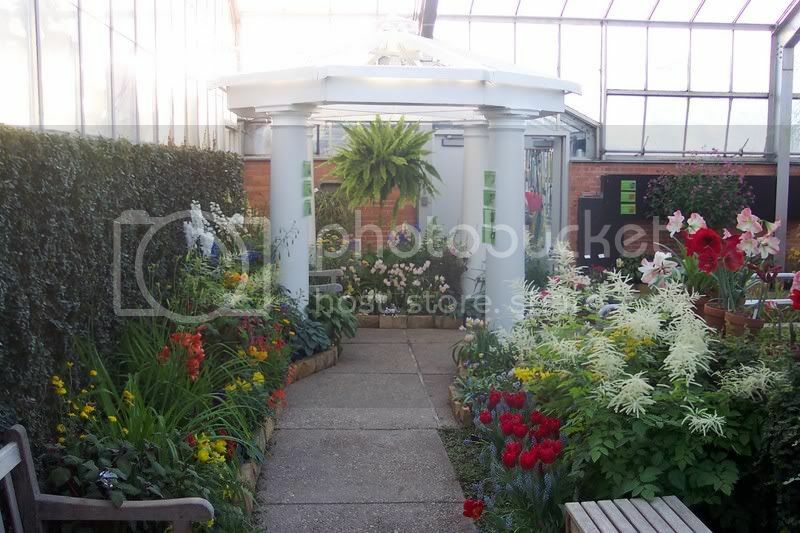 If you are interested in antique varieties of bulbs, go to ‘Old House Gardens‘ from Ann Arbor for a wide variety. They have summer bulbs such as lilies that you can order now instead of having to wait till fall. Someone asked me a couple of days ago how do we manage to sow all those different seeds each spring. You see, we sow thousands of seeds, involving dozens of varieties. Each type of seed is a different size and shape. 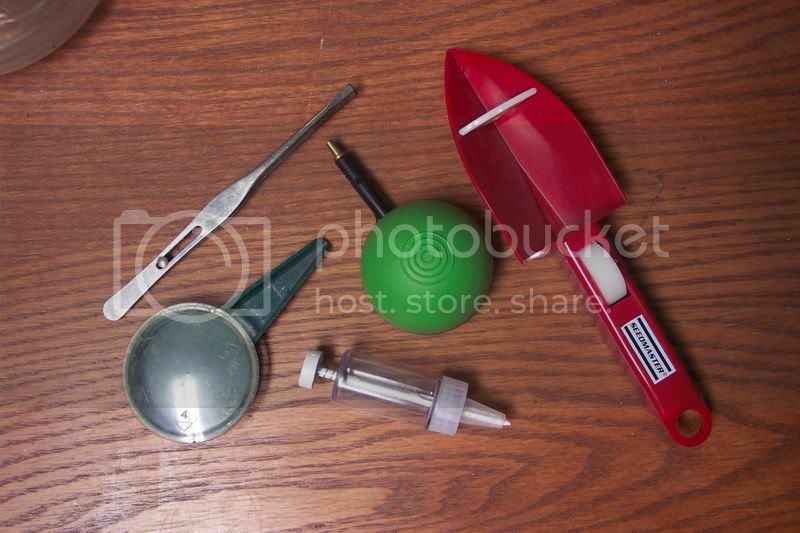 Other than our fingers, we have some tools and devices that help the process along. Here we see the five main tools we use in the greenhouse; tweezers, a suction-type seeder, a hypodermic-type seeder, a vibrating seeder, and a seed holder. Tweezers are used quite a bit for medium sized seeds, we just place a small pile of seeds in the palm of our hand and pick them out one by one. It is a slow process but you can develope some speed with practice. 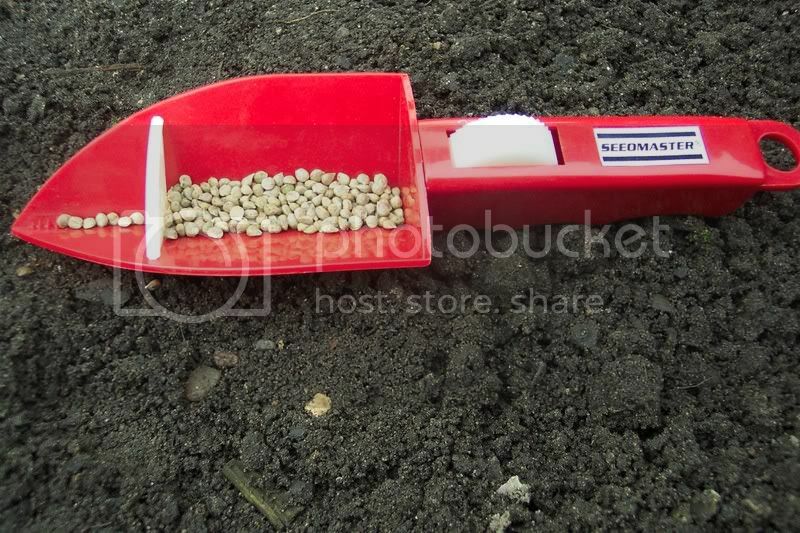 The suction-type seeder is used for the smallest of our seeds, begonia, petunia and the like. The device comes with three different size tips. You use the one closest to the size seed you are working with. The suction seeder also picks up one seed at time. You just squeeze the bulb and release, it creates a vacuum that is used to pick up the seed. Many times the seed we sow with this tool is very small and hard to see. It helps to place the seed on a piece of white paper. This tool occasionally will get plugged up with debris. The manufacturer sends along three stiff pieces of wire that you use to unclog the tip. Don’t do what one of my helpers did and throw away that little 1″ piece of paper. That is how the cleaning wires are packaged! The vibrating seeder is used for medium sized seed that are some-what heavy. The vibrating action of the tool can flip light weight seeds right off your table and on to the floor ! This device has a knurled wheel on the handle that you turn with your thumb. The wheel rubs on an internal part of the seeder causing it to vibrate thereby shaking off the seeds from the tip. A set of interchangeable baffels with different sized openings keeps too much seed from collecting at the tip. The “hypodermic” style seeder has a plunger with a groove cut into it. As you press the plunger up and down it picks up a seed from inside the seeder and deposits it on the soil. The tool we use the most is the seed holder. This simple tool has a round part to place your seeds into. A clear cover that has different sized holes cut into it, keeps too many seeds from moving into the spout. 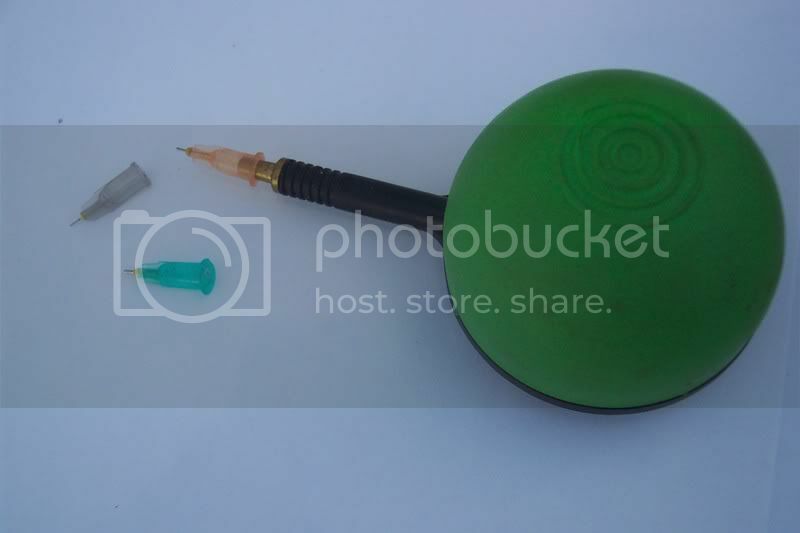 To use this tool you just tap the side with a pencil or rub the ridges molded into it. This causes a slight motion that moves the seed. 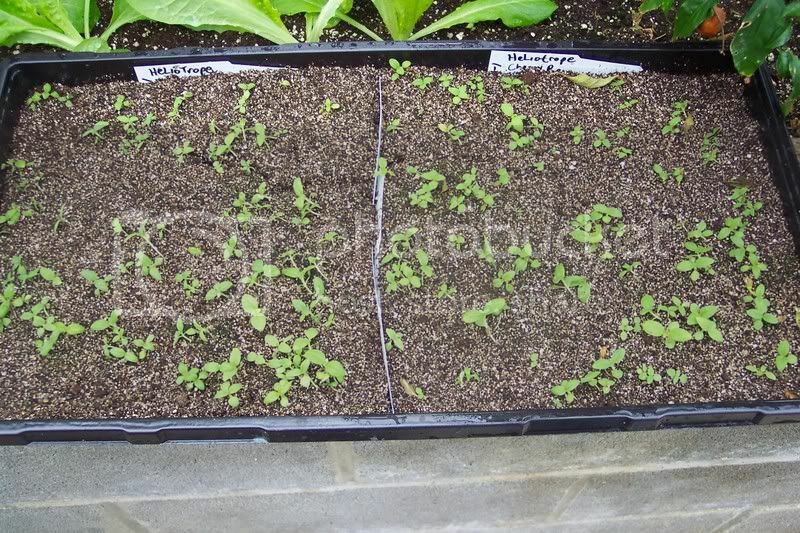 If you have it slanted down at just the right angle, the seeds can be placed very accurately onto your potting mix. We use a variety of containers for sowing seed into. A six inch pot works great whenever we have just a few seeds to sow; anywhere from a half dozen to a maximum of about 60 or so. 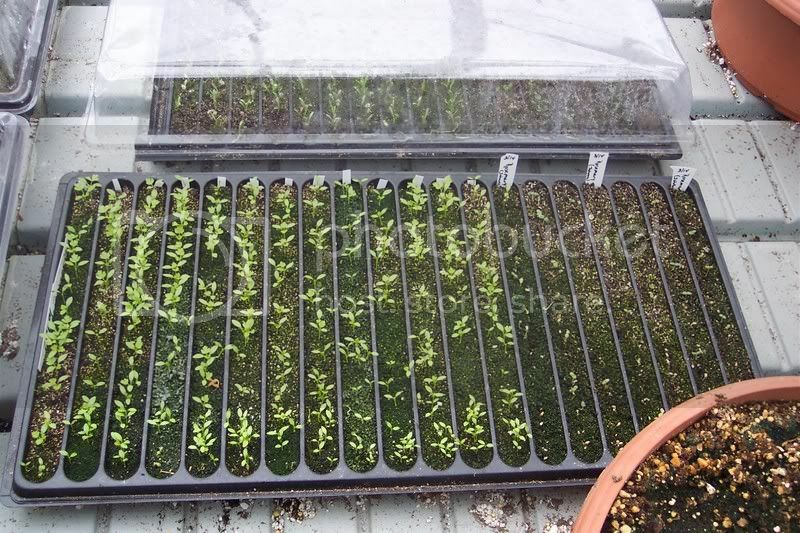 The divided-row flat is used for a greater quanity of seed, twenty five to fifty seeds fit in each row. 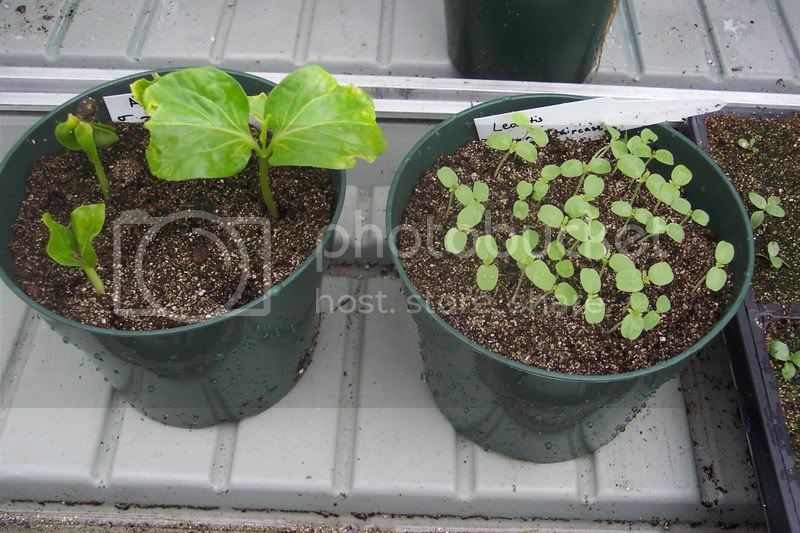 It is also used to sow different varieties that you would like to keep apart but have the same germination requirements. 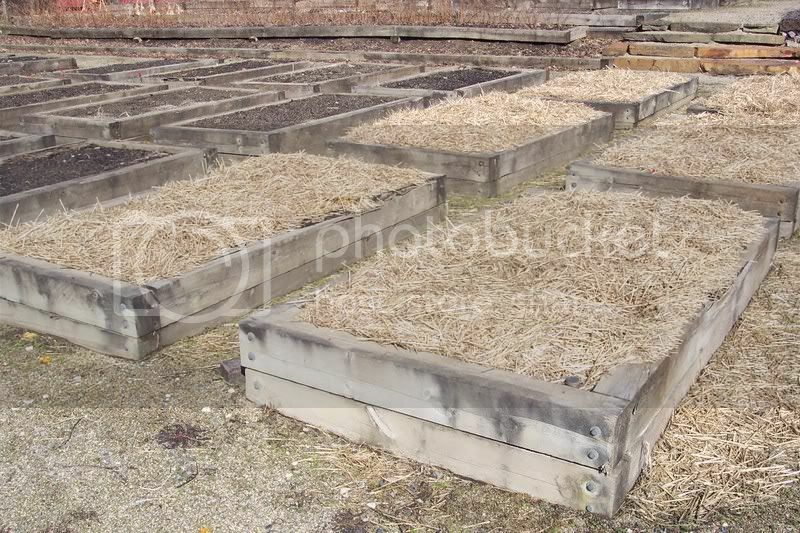 An undivided flat is used when we want to sow the seeds thickly as in the case of onions. Here we divided the flat in two using plastic pot tags. On occasion we sow the seeds directly into “cells” that range from 48 to 128 cells per flat. We also have sown into Jiffy pots and other containers. The old stand-by, a cut down milk carton works wonderfully as do yogurt containers with drainage holes cut into the bottom. Next time we will discuss starting mix and seeds. I had a chance to check the garlic beds yesterday. Frozen soil is a good thing this time of year. 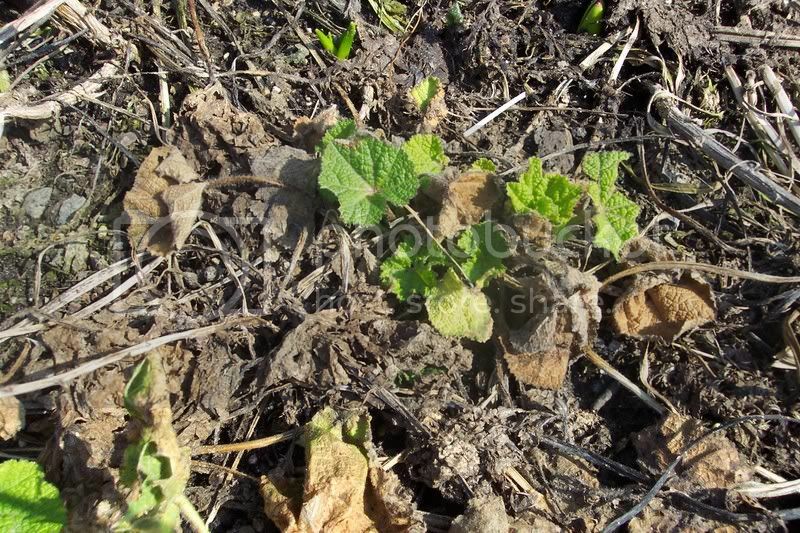 Alternating freezing and thawing (which would happen if the beds were not mulched) will “heave” the plants out of the ground and damage their roots. 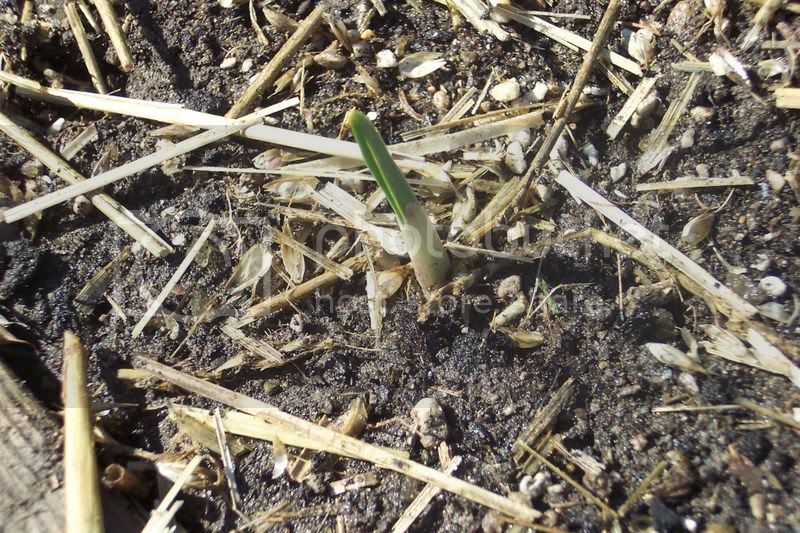 This way, a nice slow thaw can happen without any damage to the garlic. 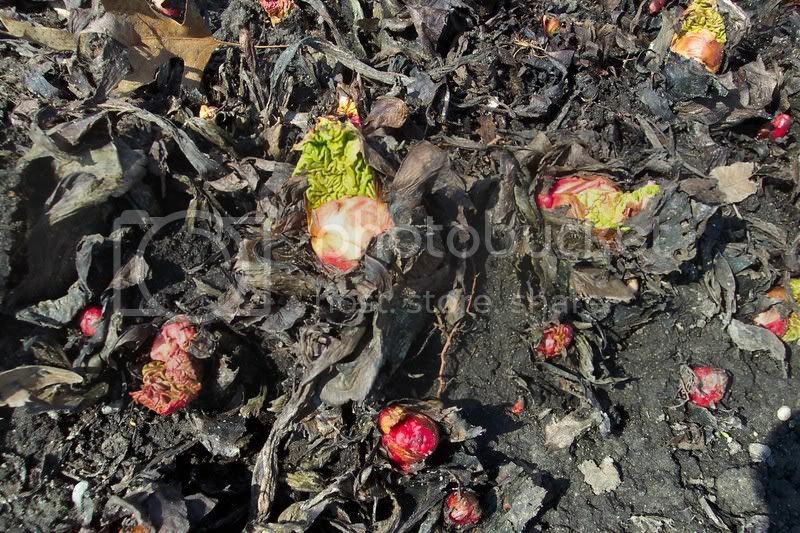 We mulch strawberry plants in the fall for the same reason. What we can’t see in the photos, are the roots that the garlic put down while under the straw. Encouraging root growth is one of the most important things to do if you want to harvest those nice big cloves we all love.